Here we have a weak  carpenter's square with a leg , which has been attacked at the vital point. 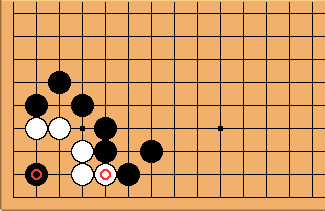 In carpenter's square variations, White attaches at a 1-2 point. Here too? And will White play her first move on the leg side? meaning the absent stone at the 4-4 point. meaning the marked white stone.